In this article you will find 2 list to help you identify your Hummel figurines. How can I identify what Hummel I have so I can find the value of my Hummel? There are a few ways to identify which Hummel figurine you have. Visually – If you do not know the Hummel number or name. How to Identify Your Hummel Figurine Using the Hummel Number. The easiest way to identify which Hummel you own is by the Hummel number on the bottom of the figurine. You can read my guide on Understanding the Hummel Numbering System for more information on how to find the Hummel number and what it means. 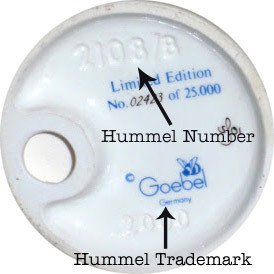 Each Hummel figurine will have a Hummel number, this is the model number assigned by Goebel. This PDF file has all the Hummel figurines list by Hummel number and corresponding name. You can use this to quickly search for the name of your Hummel. Download the free Hummel by Number list here. How to Identify Your Hummel Figurine By Name. In some cases you may not have access to the Hummel number but you may know the Name of the Hummel figurine. Since almost anything to do with Hummels uses the Hummel number and not the name it is important to have the number for reference. This PDF file has all the Hummel figurines list by Name with their corresponding Hummel number. You can use this to quickly search for the Hummel number of your Hummel. Download the free Hummel by name list here. Another important piece of information you need to value your Hummel figurine is the trademark. The trademarks is used to date the figurine. Since a Hummel’s value can dramatically differ from trademark to trademark it is extremely important you understand which trademark your Hummel is. You can read more about How to find the age of your Hummel here. If you are looking for the value of your Hummel, you can get a complete Hummel Value Guide here. If you have any questions about how to identify your Hummel feel free to leave a comment below and I will try to help you figure it out. I have a figurine that I’m trying to identify. It looks very much like a Hummel, but the only marking on it is what looks like ” B Hummel” on the base of the figurine. Its the figure of a boy holding a book with the other hand in the pocket of a jacket with small flowers painted on it. The boy is wearing brown slippers that are much to large. I have a picture of the marking and figurine if needed to identify. I have a Hummel 198 2/0 Home From Market that has a different Markings than the TMK 1 – 8. It shows the copyright symbol © on the left and above the G in Goebel. if that wasn’t there it would be a TMK 5. Could you help me understand why this is so? Thank you Mary. I have a Hummel 111 Wayside Harmony that resembles TMK6 but has an added copyright symbol to the right of the G. is this a real mark? I have Hummel number 185 Accordion boy and Hummel number 240 Little Drummer Boy that I cannot find on the price guide. I have identified the year of manufacturer and the fact that they were all stamp signed. How do I find their fair market value? I have what looks like a Hummel figurine but cannot find a number or a mark. I know that it is old because of where it came from. It is a little mail boy with a mail pouch around his shoulder. He is holding a letter up and a little dog is sitting beside him with what looks like a package in his mouth. the mail boy has a cap on with a green jacket, brown shorts and brown shoes.